The Nutcracker ballet has long been a staple of children’s Christmas entertainment, offering a world of dolls, mice, and best of all, dancing sweets. With E.T.A. Hoffman’s 1816 story, The Nutcracker and the Mouse King, acting as the original source material, the ballet is based on Alexander Dumas’ adaptation, The Story of the Nutcracker. With numerous ballet productions performed over the years, it’s a story that often differs in its retelling, with the Disney live action film, The Nutcracker and the Four Realms the latest take on the classic. On Christmas Eve, Clara (Mackenzie Foy sporting a very convincing English accent) mourns the loss of her late mother (because Disney criteria stipulates there must be a dead parent; Clara’s mother is alive and well in the original story). Her father (Matthew MacFayden) passes on to her a gift from her mother, an egg shaped box, but with no key in sight she is unable to unlock it. That night, to her dismay, she is forced to plaster on a smile at the annual Christmas party hosted by her godfather Drosselmeyer (Morgan Freeman). When it comes time for presents she follows a line of string bearing her name, ending up in a forest where her gift, a key, is snatched by a mouse. With the help of nutcracker guard, Philip (Jayden Fowora-Knight) Clara travels to “the fourth realm” before escaping from the evils that lurk there (read: a crapload of mice and Helen Mirren). Arriving at the palace she meets the three regents of the other realms, Shiver (Richard E. Grant) of the Land of Snowflakes, Hawthorne (Eugenio Derbez) of the Land of Flowers, and Sugar Plum (Keira Knightley with an extremely irritating voice) of the Land of Sweets. They are at war with the Land of Amusements, which they now refer to as the fourth realm, led by Mother Ginger (Helen Mirren). In order to win the war, they must get back the key which belonged to their queen, Clara’s mother, Marie. Those hoping for a ballet extravaganza may be disappointed to discover there is only one ballet scene in the film (plus a tad more accompanying the closing credits), though it is danced sublimely by American ballerina, Misty Copeland. The remainder of the film is spectacular, if not by way of dance. The art direction, production design, costumes, make-up and hair styling all combine to produce what is an absolute visual feast, with Keira Knightley’s fairy floss inspired hair-do a particular highlight. James Newton Howard contributes a score which includes adaptations of the Tchaikovsky score we all know and love, adding a sense of nostalgia to an otherwise quite different story. Lasse Hallström directs, with Joe Johnston reportedly filling in for him for 32 days of reshoots. Their final product looks wonderful and it’s in the story where the film falls short. That may not necessarily be debut screenwriter Ashleigh Powell’s fault, because much of the general story does follow the Disney formula. While it so often works, its twists have become rather predictable on account of being reused in so many of their films. Although to be fair, this one doesn’t become obvious until shortly before the reveal. There are some great female characters who lead the way, with Clara leading the army in an almost sensible outfit (but surely pants would have been ideal), and the dialogue, for the most part, is well written due to its succinctness. But did we need this reworking of the classic tale, which hasn’t seen a film version since 1993? 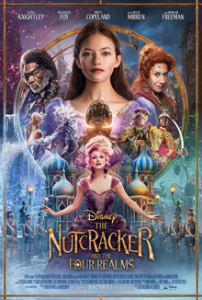 Ultimately, like many Disney live action reimaginings of late, The Nutcracker and the Four Realmsis strong, but not incredible, nor that necessary. If you want to really treat your kids, take them to the ballet version. But if that’s going to break the bank, this will suffice. This review was first published on 19th November 2018 at Film Blerg.